One of my extracurricular activities involves working with a little place known as Back to the Past. One of my cohorts there, Dave, did a pair of articles reflecting the end of 2011 and the start of 2012. He chose to focus on Doom Patrol, The Fugitive, and Captain Marvel. An interesting mix, to be sure, but a fun one nonetheless. 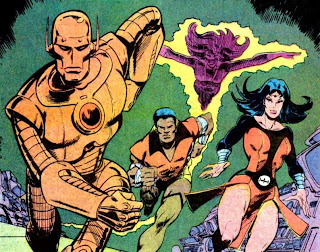 The group even starts off fighting General Immortus…it really was old home week with the Doom Patrol. Check out the links and enjoy the read. Here's the beginnings, and for all those completists in the crowd, here's the endings. As for the beginnings (definitely prefer those to the endings) I'll be offering up some thoughts on the current My Greatest Adventure series soon. Glad to see you are back! Looking forward to more posts and your thoughts on the newest stories! And personally, I vote for more Morrison-era posts. Just my two cents.